Public media celebrates Black History Month with wide-ranging portraits of the African American experience and culture, including broadcast premieres of an Oscar-nominated documentary, a four-part radio music documentary and the launch of an online series. The Oscar-nominated “Hale County This Morning, This Evening,” directed by RaMell Ross, premieres on PBS’s Independent Lens on February 11. Ross spent five years filming African American families in rural Hale County, Alabama, to capture the day-to-day rhythms of the people and the place. "So much of what we see in the media is sensationalized or politicized; the love and patience in RaMell's beautifully crafted portrait of a small town is quietly revolutionary,” said Lois Vasson, executive producer of the CPB-supported ITVS, which produced the film. 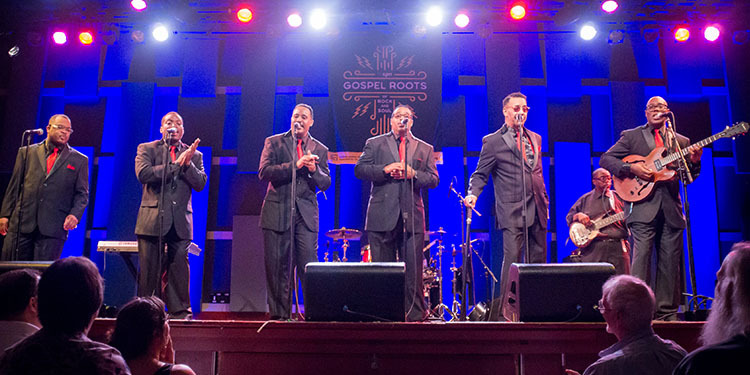 "The Gospel Roots of Rock and Soul,” a four-part radio documentary premiering on local radio stations in February, is the culmination of a yearlong multimedia project from Philadelphia public radio station WXPN exploring gospel’s role in the history of American music. Grammy-winning singer Cece Winans hosts the series, which is distributed by NPR and also premieres on WXPN’s “World Café” in March. Debuting on YouTube and Facebook Watch this month is “Say It Loud,” a PBS Digital Studios series produced by KLRU on African American history and culture featuring Evelyn Ngugi of "Evelyn from the Internets" and Azie Dungey, Emmy-nominated writer and creator of "Ask a Slave." WORLD Channel, a public media multicast channel featuring news and documentaries, presents more than 50 programs honoring Black History Month, including the broadcast premieres of several documentaries. Check WORLD Channel’s #WORLDxBHM social activity toolkit and local listings for details on documentaries, music concerts and other favorites. StoryCorps will share stories from its archive, the largest collection of African American voices assembled, on NPR's “Morning Edition” and online via StoryCorps.org and YouTube. WCLK, a jazz public radio station based at Clark Atlanta University, is airing Black History Moments throughout the month, focusing on key stories, organizations and people that made a difference, starting with civil rights pioneer Ella Baker. “Bridging the Gap, Building Bridges: Africa to America and the World,” a conversation with Africa cultural Ambassador Chief Adetunji, is scheduled to air on WCLK’s “The Local Take” on February 26. With support from PNC Bank, “The Local Take” also offers vignettes featuring Atlanta's business leaders who have enriched the lives of Georgians through the arts. PBS LearningMedia, an online archive of free learning resources for educators and students from PBS and WGBH, offers a trove of multimedia resources supporting black history and culture. Offerings include a Black History Month Collection of learning materials from Georgia Public Broadcasting that addresses civil rights and cultural history; The African Americans: Many Rivers to Cross, featuring content from Henry Louis Gates Jr.'s series with stories by and about African Americans; and learning materials on the Civil Rights Movement. AfroPop: The Ultimate Cultural Exchange, 8 pm, Mondays, WORLD Channel. This Black Public Media series tells modern stories of the African Diaspora, including “The Faces We Lost,” on stories from the 1994 genocide in Rwanda, February 4; “While I Breathe, I Hope,” following Bakari Sellers on his quest to become South Carolina lieutenant governor, February 11; and a series of short films, February 18. “Finding Your Roots,” 8 pm ET February 5 on PBS. Henry Louis Gates Jr. traces the family trees of S. Epatha Merkerson and Michael Strahan and discovers stories that challenge assumptions about black history. "70 Acres in Chicago," 8 pm, February 5, America ReFramed, WORLD Channel. This film follows the evolution of the Cabrini Green public housing development over two decades. “Pipeline,” 9 pm, February 8, Live From Lincoln Center, PBS. Dominique Morisseau’s play tells the story of an inner-city public schoolteacher on the verge of a breakdown when her enraged teen son gets expelled from his primarily white private school. “Backs Against the Wall: The Howard Thurman Story,” 9 pm, February 8, WORLD Channel and on local public television stations throughout February. This documentary, presented by Maryland Public Television, tells the story of Howard Thurman, who is credited with providing the spiritual foundation of the civil rights movement. “Sammy Davis Jr.: I’ve Gotta Be Me,” 9 pm, February 19, American Masters, PBS. This documentary examines Sammy Davis Jr.’s vast career and journey for identity through the shifting tides of civil rights and racial progress in 20th century America. "Struggle & Hope," 8 pm, February 19, America ReFramed, WORLD Channel. The documentary mines the stories of the last-remaining residents of the all-black towns that sprung up in the American West (now Oklahoma) after the Civil War. “Charley Pride: I’m Just Me,” 9 pm, February 22, American Masters, PBS. This program documents Pride’s complicated journey from segregated Mississippi to country music star. "’63 Boycott," 9 pm, February 25, Local, USA, WORLD Channel. This film tells the story of the 1963 boycott of Chicago Public Schools, when 250,000 students boycotted to protest racial segregation. It combines interviews with protesters and unseen 16 mm footage from the 1963 protests. "Late Blossom Blues," 8 pm, February 26, America ReFramed, WORLD Channel. This documentary follows Mississippi blues musician “Bud” Welch, who became a sensation with his debut record “Sabougla Voices,” released in 2014 when he was 81. In addition to supporting programming, CPB continues to help public media serve diverse audiences and reflect the communities they serve by fostering a public media system that is inclusive in its audiences and workforce. Annually, CPB provides Community Service Grants to 78 minority public radio stations, including stations licensed to historically black colleges and universities. CPB also fosters a diverse public media workforce by investing in WGBH’s Next Generation Leadership Program, the Firelight Documentary Lab for diverse media makers, and the Jacquie Jones Memorial Scholarship Fund to support media projects created by diverse filmmakers.